Setting a beautiful Thanksgiving table doesn’t need to be stressful. 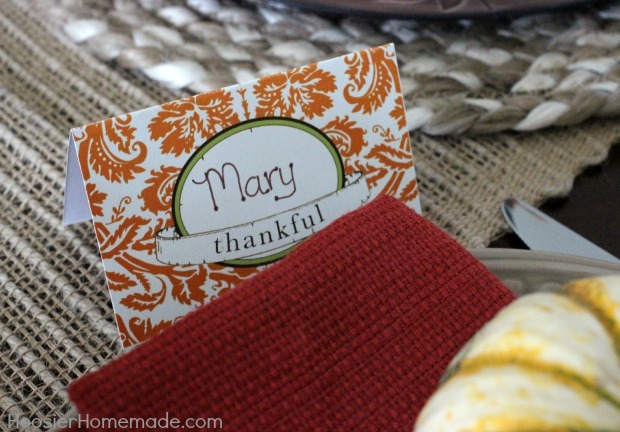 You can add simple touches like the Thanksgiving Table Decoration and the Printable Thanksgiving Cards to make an extra special table without a lot of money or fuss. 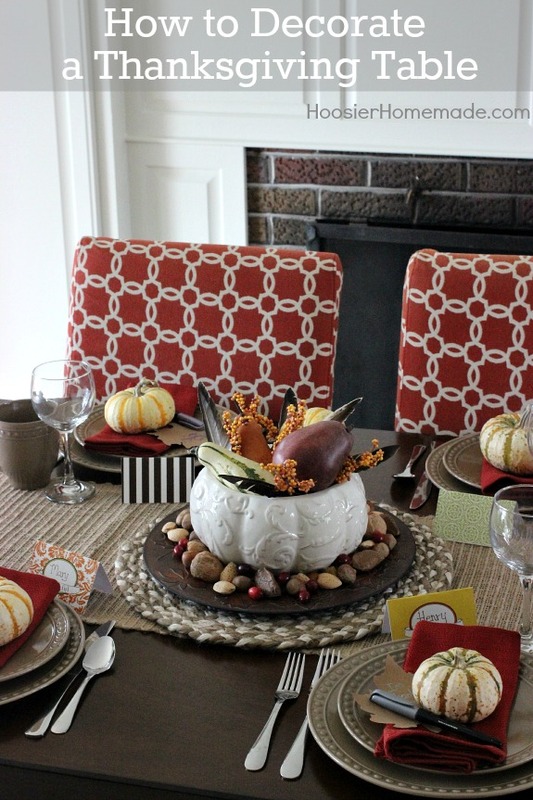 So let’s learn how to decorate a Thanksgiving table! Whether you are hosting a large family gathering, or just a few friends and family, setting your Thanksgiving table is always fun. Years ago I used to fuss and spend hours on table decorations, but I have since learned that you can still have a beautiful table without spending a fortune or a lot of time. The base of the Thanksgiving table decorations starts with a burlap table runner. It is from the Better Homes and Gardens collection at Walmart. I love the different texture it brings to the table. Then the Thanksgiving table centerpiece. 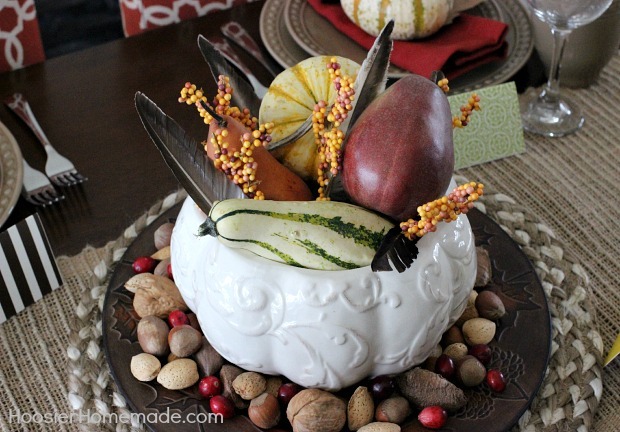 You can follow along with my step by step tutorial of the centerpiece over on the Thanksgiving page. Creating a beautiful centerpiece doesn’t need to take hours or cost a lot of money. 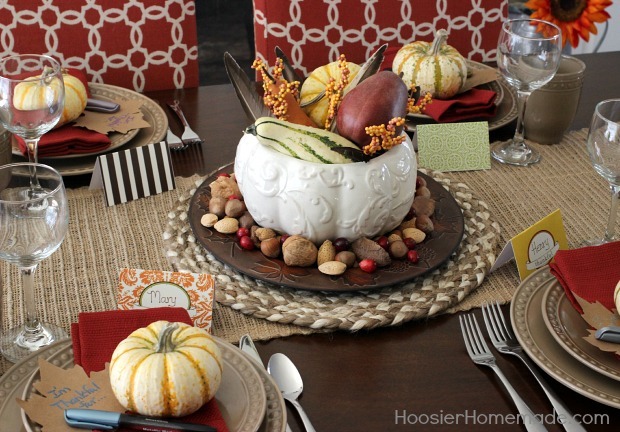 You can make this simple Thanksgiving Table Decoration in under 15 minutes. Next on our Thanksgiving table are the table settings. I don’t have different dishes for each holiday (although I would love that) but we were in desperate need of a matching set of dishes, so I was excited when I found this set of dinnerware from the Better Homes and Gardens collection at Walmart. They have many different colors in this same style, and they come with a dinner plate, smaller plate, bowls and cups. I think they are classic and will last a long time. I added a cloth napkin in rust, and then a real mini pumpkin that I found in the produce section, they have several in a bag for less than $1. Then to add a bit of a festive touch, and to give the guests something to talk about during dinner, a homemade Thanksgiving table decoration. 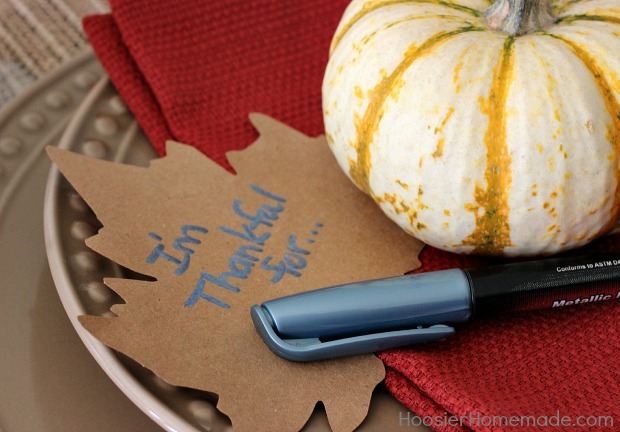 We cut out a leaf shape from brown craft paper and used a metallic pen to write – “I’m thankful for…” on each one, so then the guests can add their special touch too. And to finish off the Thanksgiving Table, we added the free printable Thanksgiving cards. Head on over and grab them for your table! And for the kids, their very own table that they will love to sit at! 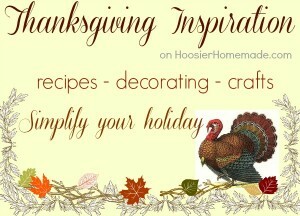 Will you be hosting Thanksgiving? I’d love to hear all about it! 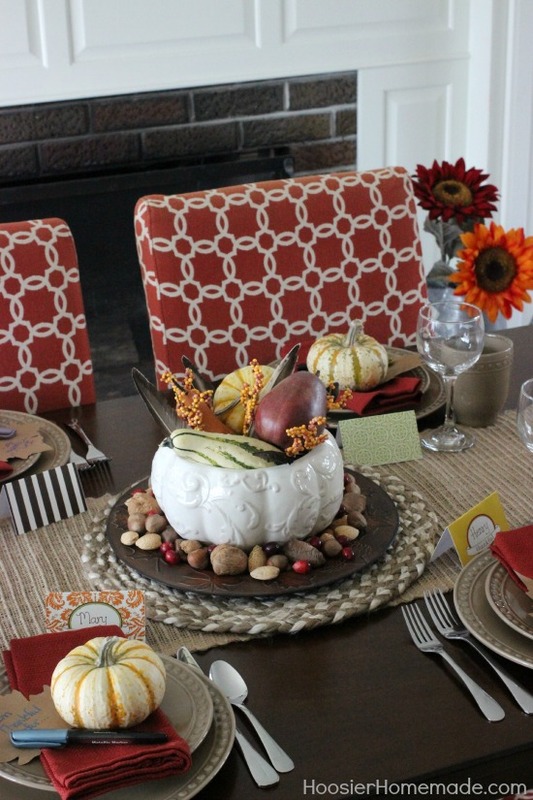 Hey Liz, love the simple yet classic look of your Thanksgiving table. 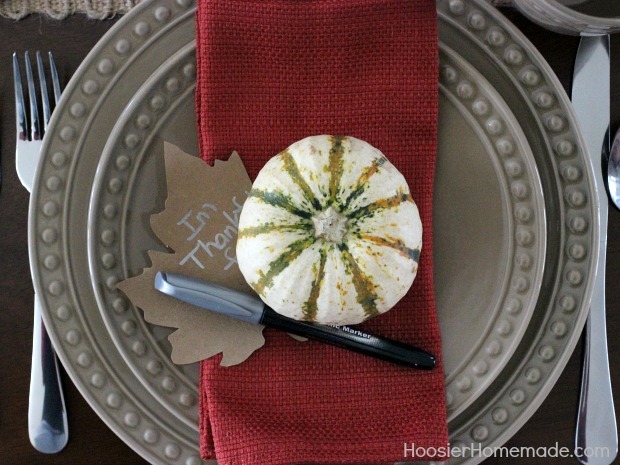 The ‘thankful leaves’ are a great idea that I will ‘borrow’ for our table this year. Hi Lynn, so excited you like the table! Thanks for stopping by! This is so pretty Liz! I am so excited for Thanksgiving this year! Pinning! So excited you like the Thanksgiving table! Thanks for stopping by Raquel! 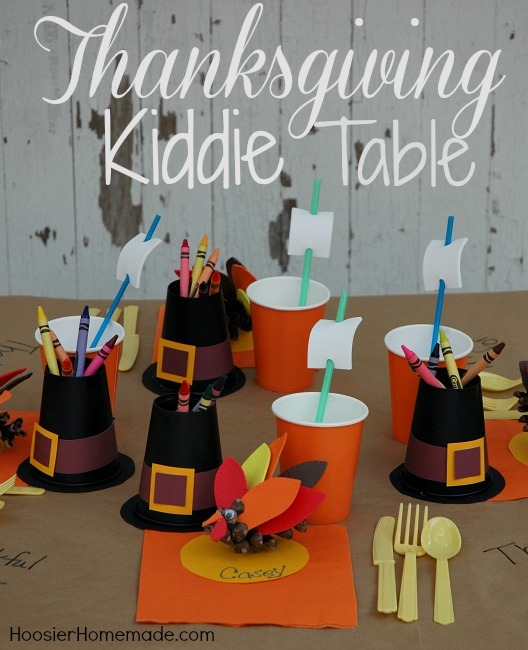 super cute Thanksgiving table! Thank you for sharing at Dream. Create. Inspire. Link! So glad you like it! Thanks Cat! What a pretty table! Love the kiddie table too! Thanks for linking up to Merry Monday! Sharing on FB! Have a great week! Thanks so much Kim! Happy Thanksgiving! I love the burlap runner and the dishes! Great choices! I have bought several of the Better Homes and Gardens items and Walmart and I really like them. Have a wonderful week!